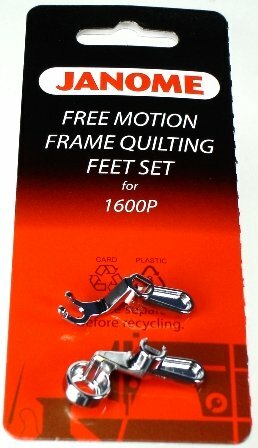 This set includes ¼"Ruler Foot and Open-Toe Frame Quilting Foot, which are designed specifically for frame quilting, the forte of the new 1600P-QC. The ¼" Ruler Foot as a high 'heel' and ½" diameter for free-motion quilting with a ¼" thick quilt rulers and long arm quilting templates.The Open-toe Frame Quilting foot has an opening that faces sideways to provide a clear view of your work when standing at the handles of a quilt frame. Interchangeable with Convertible Free-Motion Frame Quilting Feet for the 1600P Series (767433004) for maximum utility. Additional part number: 202001704-replacement screw.